Because your technology skills can drive the privacy culture The CIPT credential shows you’ve got the knowledge to build your organization’s privacy structures from the ground up. With regulators worldwide calling for tech professionals to factor data privacy into their products and services, the job market for privacy-trained IT pros has never been stronger. Do you work in IT, security, or engineering? The CIPT is for you. How about privacy by design, software engineering, data management or audit? Ditto. Whether you work in the public or private sector, data privacy skills are quickly becoming a must-have—and that’s a great opportunity for you. 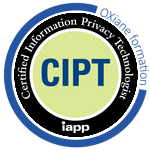 The CIPT is the first and only certification of its kind worldwide. It was launched by the IAPP in 2014 to meet the growing need that only tech pros can fill—securing data privacy at all stages of IT product and service lifecycles. The IAPP’s certifications in privacy and data protection law and practice have plugged thousands of professionals into the information economy. Now technology pros like you can take privacy knowledge—and your career—to a higher level. The CIPT body of knowledge outlines all the concepts and topics that you need to know to become certified. The exam blueprint gives you an idea of how many questions from each topic area you can expect on the exam.